Discussion in '[H]ot|DEALS' started by SixFootDuo, Jan 30, 2019. BACK ON SALE ONCE AGAIN UNTIL SATURDAY The 9th of March. 8.9ms input lag. This is better than a lot of gaming monitors. Go look for yourself. Yes, this works with nVidia cards. Under PC Mode you do get 4:4:4 Chroma and Game Mode. Incredible display if you're looking for a large format high-end high performance monitor. To date, I've had 6 of my gaming buddies move to this display. Most had to get bigger desks and nearly all of them came over from 60hz to 120hz. We are all in our late 30's and late 40's. We don't have young eyes anymore. lol. revenant, elation, SJetski71 and 6 others like this. Soooooo tempting! I'd microwave a box of kittens for these qualities in a 43" size. Anything bigger just kills my neck from looking up so much. revenant, 0ptional and PestXs like this. looks like Q7F with 1440p @ 120hz pc support, I am picking up Q6F 55" or 65" might get Q8F 55", I am seriously thinking taking back q6f 49" with no freesync, and pick this up for bedroom gaming and put nice Q6F 55' or 65' for xbox or pc lol, I love playing on big T.V. I get sucked up playing on this 49" i cant wait for 55" or 65" It worth money, I will say that! Can it do 1440p with a 1:1 pixel mapping? I don't want to interpolate the image. 55' seems like it would be way too big for a 1440p gaming monitor. I feel like those would be some pretty noticeable pixels. I have Q6F 49" its clear as day, I get 55" I am going be atleast 3-4 feet away, i dont need my eye balls rolling around left to right. I would "guess" the same thing and think that you would rapidly be approaching 4k territory at this size. That being said everyone's eyes are different, also sounds like an awesome monitor. pppppleaaaseeeeeeee stop calling all TVs 55" or over BFGD. thats not what that means. these aren't nvidias displays. Viper87227, ItWasMe, SolidBladez and 6 others like this. I never said "any" TV ..... I said "this" display. Who says? You sayz? lol ... get over it. Let me break it down for you ... BFGD .... Big ... Format ... Gaming ... Display ... what do you think 55" is? You think I care about nVidia's brand marketing? Yeah riiiiiiiiiiiiiiight .... told you people before, I'm value and performance oriented. 1440p ? .... CHECK! .... 120hz? .... CHECK! .... HDR? ... CHECK! ..... 9ms input lag? ... CHECK! .... 2ms Pixel Response? .... CHECK! Works with both Freesync and Gsync? .... CHECK! If you really want to go pay nVidia $4,000 dollars for the right to tell people you have a BFGD ... be my guest. But, I also have one. $799? Double hell yeah baby! Same difference ... who gives a F about 4k @ 144hz ... There is literally nothing, repeat nothing on the market that can push that. Oh, well, let me re-phase ... if you want to spend $3,000 on 2 x RTX 2080 ti's ... for a total of $7,000 .... if the SLI Profile Gods are in your corner, maybe. Sorry, this is an affordable BFGD all day long. Make no mistake. You, go take you're $7,000 dollars .... put it in your mouth and buy one. Then, come back, take some pictures, post them, and tell us you have an "official" BFGD. Then we can all laugh at you. Adidas4275, tangoseal, revenant and 5 others like this. If you can get a wide enough desk, I would suggest going to a used office furniture store, they are cheap and plentiful. Look at my desk. It's a commercial office desk that retailed for $899 ... I know, I looked it up and I paid $40 dollars for it. Sit back at least 4' .... not hard to do ... it's amazing. Totally immersive and old eye friendly ... love to chill, watch pr0n, movies, video games. And it's a lot easier, a helluva lot easier to surf the web, write and email, etc etc. Fantastic piece of hardware. But... I would never use this as a PC monitor as it is way too big. Could be a real beautiful PS4 TV/monitor though. Eh, I already spent a lot on Black Friday. But maybe next Christmas if I want to upgrade my console display. 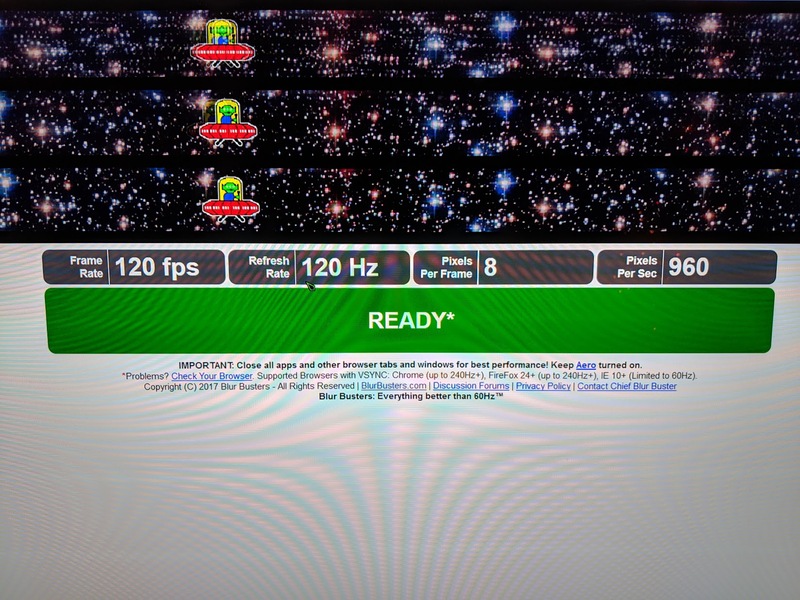 PS Is it true 120hz or is it the interpolated TV 120 hz? There is a significant difference. It's a true 120hz native display. My posting is also meant to educate people. Most people have no clue just how amazing some of the 2018 Samsung's are. Are there anything different between the 55 and 65 besides the size? Not gonna lie, I also assumed this was a thread about the nvidia BFGDs, and was wondering how they got into the wild without being reviewed anywhere yet. With all of your "CHECK!" it has no gsync or even equivalent based off of what you're saying. In the meantime, maybe you should avoid getting to butthurt after confusing people with your thread title. dragon69 and GoldenTiger like this. What do you mean it has no gsync? Nvidia supporst freesync now so gsync doesn't matter as long as your card supports adaptive sync. WHich Nvidia does now. 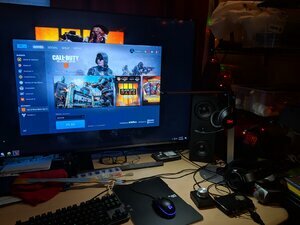 Freesync will not work on Nvidia cards from this TV. Nvidia ONLY supports Adaptive Sync (whether its Freesync or their own Gsync) through DisplayPort. 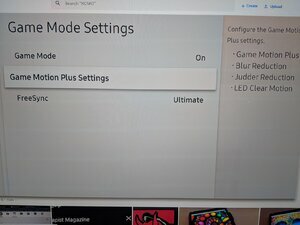 The TV has no DP connections, Freesync is through HDMI so that feature will not work on Nvidia cards. Silentbob343, Burticus, GoldenTiger and 1 other person like this. You do understand how quotes work right? You're not confused and if I were you, I would certainly not speak for "everyone" else.. I promise, it's probably just you. You're just ignorant of it's application. And that's OK, I will help you for future reference. Here, digest this. repeat or copy out (a group of words from a text or speech), typically with an indication that one is not the original author or speaker. It's also called word play. People get it. Gsync or even equivalent? 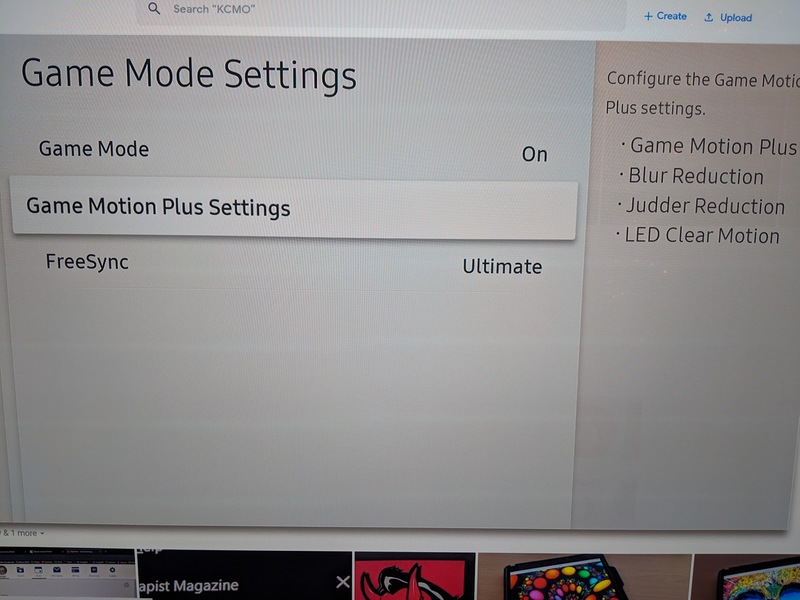 Freesync is not an equivalent to Gsync? ... not only that, vsync also qualifies to a degree. The point being, all bases are covered. You're engaging in petty nit-picking. They all have pro's and con's. Who cares if you skip, drop or dupe a frame out of 120+ frames per second using vsync? I can speak at depth on this subject. Ask and I will. I'm passionate about hardware, especially being able to cut thru all the BS and Gimmicks. If you want to go pay nVidia $7,000 dollars for an official BFGD setup... then go and do that. Maybe you have the money. I know most kids don't as in 90% of consumers. The point of my posting is to provide a different avenue, an affordable alternative. This is an attempt to educate this community. I would be so happy for you if you took $4,000 and went and bought an official BFGD. Trust me, if I ever run into one of these $4,000 BFGD's ... I would really think that was cool. But, this one, it's only $799. Also, it could just be 2018 models that lack DP ... rumors from CES that was just held a few weeks ago or so are reporting that 2019 Samsungs could have DP and most certainly HDMI 2.1. Let's see what AMD and nVidia do is this regard with future hardware. At any rate we are about to converge at a point where everything should harmonious exist between graphic cards and displays, large or small. Pick your poison. So the point will be moot soon enough. I'm guessing in 2020 we can all stop bitching about this as none of this will matter. In the mean time, if you want a Big Format Gaming Display experience at an affordable price until then, I've included a link. Good luck! $799 is incredibly cheap for what you get, hands down. 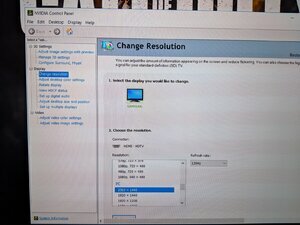 The 49" display does not have the 120hz panel. This is the size I wanted at first as well. I read that the overseas 49" model does in fact have the 120hz panel. EvilViking and ItWasMe like this. Was interested until realizing (and was pointed out before) that no DisplayPort means no GreeSync on NVIDIA GPUs. For consoles it would be amazing. Silentbob343, ItWasMe and GoldenTiger like this. If only this come in a 40-43 I would be all over it. ItWasMe, Jarod888, Porter_ and 2 others like this. Man, the specs look good but 55" is just too big for me. I tried using a 40" 4K and that was already making my "head on a swivel" fest already. Good luck to those that have room / peripheral vision at this size - that price is on par with my Alienware 34" 3418DW but for a 55"! 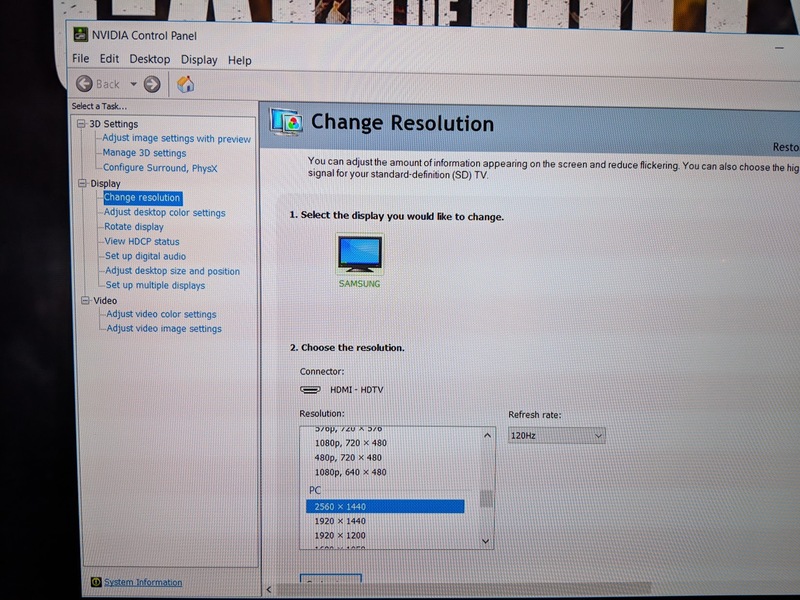 You still have 120hz @ 1440p under vsync on nVidia ( see pictures ) I have this display and can report, there is zero tearing, smearing, lagging, anything. It's a mind blowingly butter smooth beautiful experience. Even thou AMD cards are under powered, you still have VRR with those cards. Also, nVidia says it's possible to support gsync via HDMI and have said that it's still a possibility. revenant and ItWasMe like this. Anyone know if the 65” model has the same native 120hz and freesync and all that jazz? Was looking for a new 65" for the living room and at $999 I might bite if it has the same features. I think it's so awesome that Samsung has brought FS to these displays. Anyone know what the FS window is? Yep. The 49" is the only one that lacks native 120hz. Any opinions on how this works as a TV? I've got an older Toshiba 55SV670U Regza 1080p TV on the opposite side of the wall from my computer that's from 6/2010. This old LED LCD TV was originally $1700 and continues to work well so have seen no reason to replace it. This might be a reason to move it to the bedroom and use this as a dual purpose TV/gaming screen. I'm sure it does tv just fine. Do the 75" and 82" have the 120Hz panels for 1440p @ 120Hz like the 55" and 65" do? The 80" NU8000 is around $2,000 to $2,400 dollars. The higher end Samsungs are around $2,800 for the 82"
All have native 120hz panels. Tempting but I'll be waiting for a 4k 120hz projector that's not probably over $10k. Nice. I'm looking around 43" though, 50" max. 55 is probably too big. Thanks for the heads up on this tv! Yesterday I bought the Samsung 55" 7100 tv.. now after your info I went and exchanged it minutes ago for the 55" 8000 series!! Haha. No brainer when the TV is going g to be gamed on with ps4/xbox one x/switch about 90% of its life. ItWasMe and Porter_ like this. Amazing diplay. I wish Samsung would do more to tell people just how amazing these displays are. People out there are clueless. Glad I could help. revenant, vjhawk and eclypse like this. Do you know of any smaller ones that have all this? 55" is a bit much for me personally, haha. I don't think they say too much about it because they want to sell you those ultrawide gaming monitors they make too. I believe the 49" doesn't do 120hz. I have 49" q6f, it only has 120hz panel and no freesync, max PC rez 1080p 120hz. Also 49" nu8000 is 120hz panel only. I picked up q7f 55" my BB was out stock and I didn't feel like waiting. Q7F is really awesome, my PC gaming and xbox one X looks awesome. Honestly I think samsung uses same VA Panels in Q6F,Q7F series and Nu8000 series with less options then Q series. None of the 49" Samsungs have the 120hz panel so be careful. You can research this on the internet. Also, I am pretty sure the higher end / larger displays have 120hz panels. You guys can again research this yourself. I used rtings on top of following "Joelster" on YouTube and watching some of his videos. There are also a few other videos out there regarding the features of these displays. The big problem is, there isn't enough. All this information is very limited and a majority of gamers have no clue this is even on the market. ItWasMe and eclypse like this. You are correct the 49" displays are 60Hz panels.